It has now been six years since 75 human rights defenders were imprisoned in Cuba for nothing more than peacefully demanding fundamental rights. In March 2003, activists throughout the country were arrested by the Cuban government and summarily tried and sentenced to as many as 28 years in prison. Today, 54 of them remain in jail, many with severe illnesses they've developed from poor prison conditions. 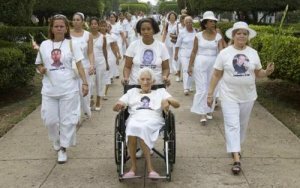 Their wives, sisters, daughters, and loved ones have formed the Damas de Blanco, or Ladies in White, who march every Sunday through the streets of Havana to demand the release of their family members and to promote human rights in the face of constant harassment. This year, they held six days of religious services, peaceful marches, and assemblies in front of government offices to mark the anniversary. Their events were repeatedly broken up by government-organized mobs. On March 8, their commemoration of International Women's Day was also interrupted. On both occasions, members of the organization who live outside Havana were reportedly prevented from traveling to attend the events, a violation of their rights to movement and peaceful assembly. In a recent report to the UN Human Rights Council, the Cuban government claimed that all Cubans "fully and universally enjoy all human rights." The unjust jailing of 75 human rights defenders, and the continued harassment of peaceful activists such as the Ladies in White, undermines such a claim and violates fundamental human rights. Please call on the Cuban government to end the imprisonment of the 54 human rights activists jailed six years ago, and to respect the efforts of the Ladies in White to promote human rights. Action taken and noted with thanks Tom. Thank you for choosing to make your voice heard. Please encourage your friends to do the same! Hey Tim, I often see you write in favour of Israel... how about the thousands of Indigenous Palestinian people in Israeli prisons for years without charges or trials? Why focus on Cuba's laws against people taking money from the USA to renew capitalist oppression and exploitation in Cuba? Oops, sorry Tom, I meant to write "Tom", not "Tim"
Signed and noted. It's great to get this information out to people, most have the impression this just doesn't happen in Cuba, of course that's nonsense. Than you for the infomation. I signed and noted. Dear amigos, please read this article before you choose whether or not to take action:. As I said above, those 75 people in prison were given fair and open trials and found guilty of taking money from the U.S. government to renew capitalist oppression and exploitation in Cuba. The information about the case is available to you all (there is even a book published about the case), and proves that they took money from the U.S. government to renew capitalist oppression and exploitation in Cuba. No other country would accept people doing what those 75 people did (except for Venezuela, perhaps, which has given amnesty to the people who attempted a coup in 2002). Kit wrote: "Signed and noted. It's great to get this information out to people, most have the impression this just doesn't happen in Cuba, of course that's nonsense." Noted and already signed. Thank you, Tom. "You have already participated in this advocacy campaign." Thank you Tom signed, "Thank you for choosing to make your voice heard"